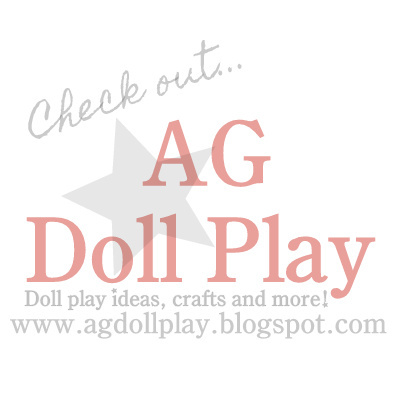 American Girl Doll Play: A Few New Favorites! Lily's favorite gift from Santa this year was McKenna's loft. She absolutely loves it! 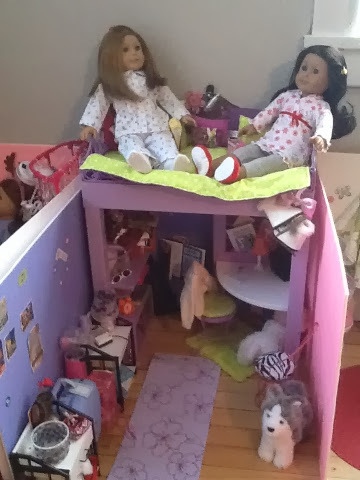 Replacing Lily's book-case bedroom with McKenna's loft gave Lily (and me!) a reason to set up a new doll room. Setting up the dolls is my favorite part of playing. I use foam core for walls in our doll play space, which makes rearranging fun and easy (and inexpensive). We absolutely LOVE the loft bed! Especially all the accessories it came with! 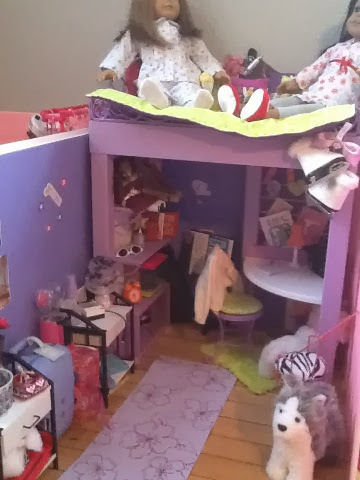 I do think it needs a light under the bed...one that really works, so I will be looking for something, but so far the 'girls' are enjoying hanging out on the loft! Emily, Lily's new AG doll was quickly renames McKenna with a hair cut, as she does not have McKenna. Gracie's favorite surprise from Santa was Saige and her 'stuff', which included the OG horse stable. This set came with so many cute accessories as well that it really adds to the horse play. with shelves and hooks on the stable wall, it cleans up our horse space (which previously had been housed under our desk). With the stable doors open, and the fencing attached to the front of the pen, two large horses and two foals fit comfortably in the three stalls. I had a piece of foam core that was covered with wood grain shelf paper that I used to extend the flooring in the pen and define our horse space. 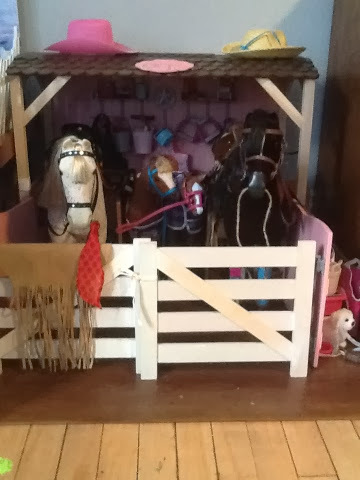 I love the pink/ brown and white's used on the stable. The girls favorite AG gift from me and their dad was McKenna's gymnastic set. 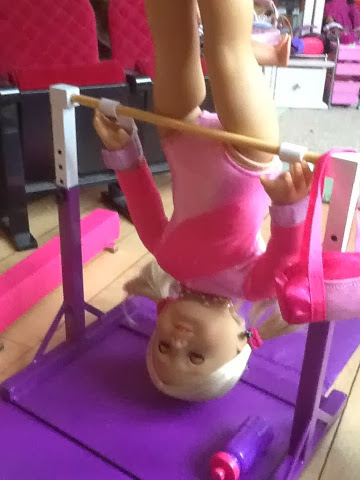 This has so much play value that I didn't expect, but the girls have really spent so much time 'playing' gymnastics! What fun! 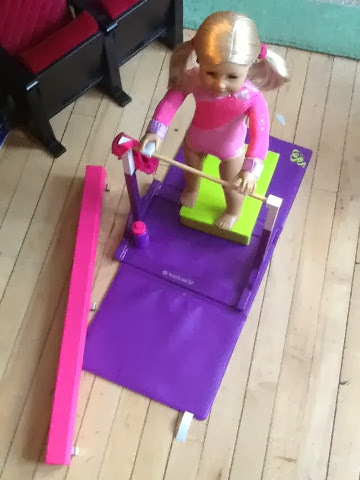 My daughter got McKenna and her bar and beam set and LOVES them! I have a question. My daughter loves AG!!! She currently has 6 dolls and is saving for Rebecca. As much as I love seeing her play and read, create movies, and love our crafting and dollie time, I feel there is a point of going too far. Does anyone have a limit on dolls at their house? This year My daughter went from four to eight dolls (3 being purchased at the MCM benefit sale for just $30 each) she received one at the sale, one for her birthday and 2 for Christmas. She was just telling me that she doesn't want anymore dolls this year, she thinks she has enough. Maybe your daughter will decide on her own as well? The funny thing is, I was thinking we had too many as well! Dev Vol we would not limit dolls if she was saving her own money for them. But that might just be me. I feel it is important everyone my husband and I included have a little no questions asked money. Thank you for responding. Both comments are very helpful! I do love seeing her work for what she wants and feeling so proud to hit that goal. Maybe she will decide thats enough once she has the dolls she hopes for! Mainly the historical collection.